Free webinar will provide tips green industry businesses should consider to achieve the same growth as their high-performance peers. Our goal with the webinar is to leverage the data in the benchmark report to improve a business. HindSite Software, the premier provider of field service software to the green industry, recently announced a new webinar designed to help green industry businesses understand the results of a recent survey. 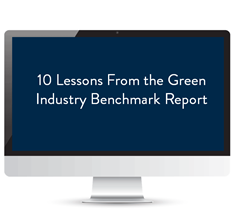 Scheduled from 1 to 2 p.m. Central Time on Tuesday, March 13, 2018, 10 Lessons from the 2018 Green Industry Benchmark Report, will analyze data from the recently released 2018 Green Industry Benchmark Report. The 2018 Green Industry Benchmark Report is the culmination of a two-month-long surveying effort that reflects the opinions of nearly 300 green industry business owners and managers who provide services like lawn maintenance, irrigation service, landscaping and snow removal. This is the sixth year HindSite has released the Green Industry Benchmark Report. “Our goal with the webinar is to leverage the data in the benchmark report to improve a business,” explains Reinholz. “So we’ll go a step beyond explaining the survey results, and deliver in-depth solutions to some of the issues discovered in the survey."